This entry was posted in Ideas, MakerSlide by cvoinescu. Bookmark the permalink. It’s not really related to these plates. But the carriage plates used in eShapeoko should have one more hole in place where X rail is attached to them. So one can easily run wires between two Y motors together thru the gantry makerslide. That would result in cleaner wiring. Very good point. It’s a bit late for the current batch, but I’ll add it in the next revision. Rigidity is the main reason why the Z is short. Even 50 mm make a huge difference (to the worse), so I’m not doing it. If rigidity does not matter much to you (e.g. milling foam), you can easily replace the Z axis with a longer one, but I’m quite sure that most users are better off with the Z axis as it is. After some experience with the machine, i have to admit that you are true about rigidity. Also it’s not too common to see 3.175mm endmills longer than 52mm. So it wouldn’t make such big difference. We have the largest one (1000x1500mm, NEMA23) and i’ve noticed different problem. The 6mm gt2 belt seems too undersized… Is it possible to get upgrade kit for 12 or 15mm belts? I am relatively sure that 9mm wouldn’t be enough. In fact i think that 12mm should be default in the kit. especially for such long axes. I was looking for sources of poor performance of my machine and found that the belts are single least stiff part that affects overall stiffnes. Under load it gets deflected easily by 3mm on both axes with 9mm belts fully tensioned (even with slightly overtensioned). No need to say, that 3mm deflection is not really good for 3.2mm endmill. This seems to be bigger problem than deflection of aluminum extrusions. Can you please provide the upgrade kits? You make an interesting point about the belts. 200 step-per-revolution motors will deflect about 0.4 mm (two steps) before slipping, so you’re right, it’s not that. I have a machine with 9 mm belts on 1 m long rail, though, and 3 mm seems like a huge amount of deflection. Mine seems much more rigid than that. I’ll take some measurements when I have a chance. GT2 belts wider than about 12 mm are not practical, and if you go to a larger tooth profile you’ll automatically have larger pulleys and worse mechanical advantage (which is already a limiting factor for direct belt drive). I’ll look into it, but I don’t expect I’ll have a solution immediately. Someone came up with a very interesting idea: an inexpensive hybrid between a belt and a rack. They started with a belt running on top of the rail, with two idlers, but they also glued a length of belt to the top of the rail, teeth up. The two belts meshed together and the idlers were adjusted to press the drive belt into the glued belt. This reduced the effect of belt stretch and made it independent of the length of the rail. At least one person glued the belt to the rail and ran the pulley directly on it, effectively turning it into a rack and pinion system. 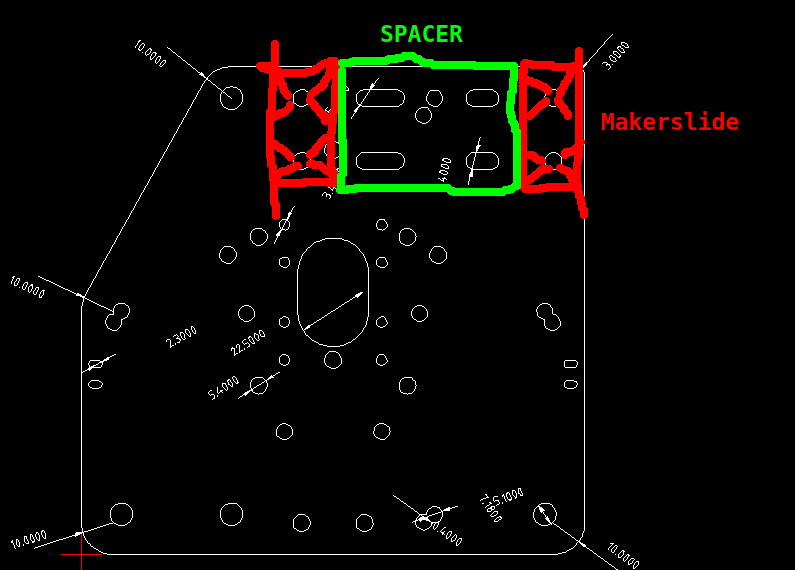 I have problems with spindle being slightly tilted upwards when engraving using v-bit. (everything rotating around X rail). Do you think it could make things stiffer? Is that good idea? I guess problem might be that it will shift load away from center of motor plate. There are advantages and disadvantages in doing it that way. Certainly, the larger distance between the rails means less force on the V-wheels to counteract the same torque around the X axis, so that’s good — but it also means a wider, more flexible X carriage. The eShapeoko gets some stiffness for the X and Z axes by having the bolts go through both X carriage plates; with a much wider carriage, you probably won’t be able to do that. I don’t know whether, overall, it would be better or worse — but I am be very interested to learn what your experience will be. I should also point out that the oval holes were also designed to be used with MakerSlide, to allow for wider carriages. You could widen your carriage by a more modest amount too. I think i could replace bolts with threaded rods if it will not be possible to get bolts in such length. Also it might be usefull to replace current aluminum spacer tubes with block of plywood or aluminum with holes for the bolts. that way there would be larger contact area and higher leverage to keep the plates parallel. The oval hole allows widening only by 5mm, which i think is far from being enough for my setup (largest eshapeoko = 1m gantry). There’s a second set of oval holes that go from 50 mm to 60 mm centers (30 mm to 40 mm space between rails). That’s a bit less extreme than 80 mm. Threaded rod works, if you replace the spacers with something a little thicker (e.g. aluminium tube). Wood is a bad choice, because you can’t really tighten those bolts firmly enough — even a little give translates into deformation of the carriage. I wass also talking about this in my local cnc community and some of the guys think that problem is in missing internal brace of eshapeoko makerslide. (original makerslide has one more internal brace). Basically if you want something to be stiff, you should build it from triangular structures, which wasn’t the case even before you’ve removed the brace. So it probably makes your version of makerslide less stiffer. They suggested that i should fill the inside of rail with epoxy. BTW i think you should include locknuts (nuts with integrated silicone rubber ring) instead of normal nuts in your kits. It’s quite common component, so it shouldnt make price much higher and i think it would be cool finishing touch to prevent nuts going loose from vibrations. i saw video of shapeoko falling apart mid-job due to vibration loosening. of course you should tighten everything before job, but chances are that it would be somehow possible to finish the job. but without it the delrin wheels can just go flying around on workpiece. no good. The original MakerSlide does not have the internal brace. A prototype did, but it caused difficulties in extrusion, so it was quickly replaced by the current design. That early drawing is still around, though. Epoxy has a very low elastic modulus compared to aluminium, and a solid mass inside the rail has lower moments than the skin, so it won’t help much. Most of the unwanted movement comes from V-wheels (they’re acetal plastic!) and play in the bearings. The rail becomes a problem only over longer spans, and the bolting together of the two X rails helps a lot. The rails do flex a little, but your colleagues are wrong about what the best profile is. Triangles don’t help much here, and they add a lot to the cost of the die. For torsion deformation, a continuous outer skin helps the most; a hollow round tube would be the best use of material. The T-slots in the MakerSlide are what allow it to twist. The flat wall without a slot helps, compared to a standard T-slot profile with six slots. For resistance to bending, a box or I-shape are best, although other profiles are nearly as good; diagonal braces are less helpful. Again, the solid wall helps. A box, possibly with rounded corners, is a great compromise for both bending and torsion. If you look at MegaRail 80, you’ll see that that’s what it is. You can replace the nuts with nylon insert nuts; they’re cheap and effective. Or you could use thread locking compound. That said, I’ve never had a problem with the regular nuts — but I tighten them very, very well, so they stay tight.